San Antonio, TX Charlie is a 7 yr old altered male who is an absolutely sweetheart. He loves everyone he meets, especially men. He has only been tested with one foster cat, but the cat ruled the house so it's unclear how he would do generally with cats. 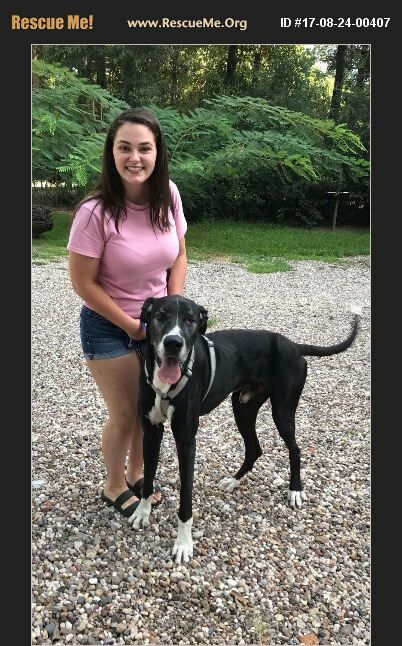 Definitely a dane who sometimes doesn't know his size, Charlie may do better in a home with older children even though he does great with them. If you have younger children, you just need to make sure he doesn't knock them over with his loving lean. Charlie would be best suited in a home with other dogs as he loves his furry foster siblings. He is happiest when with his people, so get ready to be followed around the house and receive lots of cuddles! Be prepared for a loving welcome when you get home as he likes to hop up and down next to you to look you in the eye to show you how excited he is to see you. Additionally, Charlie will want to sleep with his people, so get to the bed first to claim your spot. When outside he likes to bark straight into the sky at flocks of birds, kites, and airplanes but the first order of business is scratching his back itches. This handsome senior is leash and house trained. Although he knows basic obedience commands (i.e., sit, lay down, shake), Charlie will need someone to help show him that there's no need to pull on the leash. He is not crate trained, but doesn't challenge the 3 foot baby gate in the house as long as his dog bed is with him. As you'll notice, he does have cherry eye which isn't bothering him, but he will need his fur parent to show him the importance of oral health. Motivated by affection, Charlie will skip treats if you pet him. A true friend, he lets the other dogs steal right from his mouth! All around he's perfect for anyone who wants to be loved on by a gentle giant!